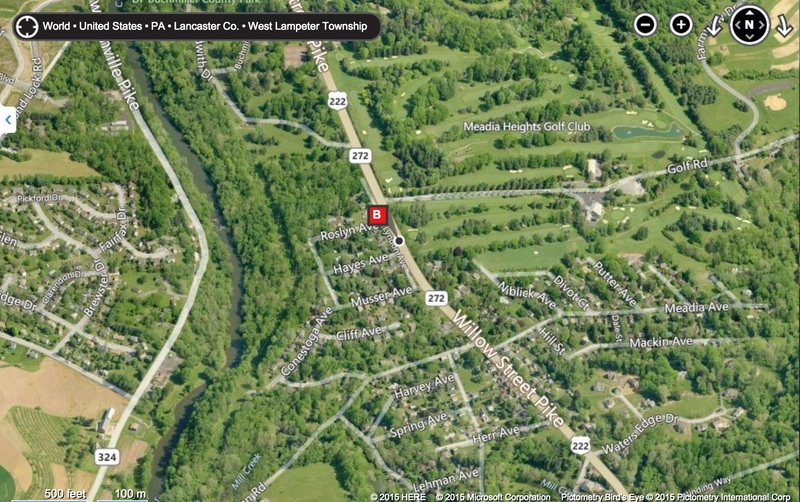 As a child there was no better place to grow up than the home our family owned in Lancaster, Pennsylvania. For a kid with my interests, the location and style of home was perfect. Our four-square house had a cupola and windows looking out the third story. One could sit in the book nook at the turn of the stairs going to the third floor and see out the back of the house, which faced the east. Summer sunrises in Pennsylvania always seemed to arrive slow and steady. The sky would brighten in the east before the sun topped the trees. When it did, the dew on the grass lit up like a thousand little lights. There was tons of green grass to explore. Our yard itself was a couple acres in size. The side yard had formerly been a clay tennis court. That meant it was perfect for games of catch or even football. The center of that section of yard was always worn thin, even to the dirt, because our games of rundown wore out the grass. This to the chagrin of my father, who treasured a rich lawn. At one point he planted a species of grass called zoysia in a corner of the tennis court lawn in hopes that it would spread to cover the entire area. His idea was that a tougher species of grass could withstand our many ball games. However it was slow to spread and ultimately covered only a corner of the yard. Mowing the place took more than an hour. When old enough to mow, I’d fire up that machine and start pushing it up and down the many sections of the lawn. And inevitably, my mind would drift at the precise moment when I was supposed to remember to steer around the sewer pipe out front of the house. CHUNK the mower would go, and it would stop. Then I’d hear my father’s footsteps thumping down the stairs inside the house. He’d run out and deliver the same lecture about paying attention and taking care of the mower blade. I could not help it. I was a dreamy kid and probably always will be. Many afternoons were spent climbing up into the maple trees of our yard. The air inside the tree canopy was cool. The branches were worn smooth from my climbs. And if one really wanted to get away from the world, there was always the tall hemlock tree to climb. Its branches were close together and it was not much effort for a seven-year-old child to climb up forty or so feet where the perch swayed and the breeze could reach you. That was where I’d go and dream. We moved there when I was only five years old. Right away I met a friend named David that became a keen part of daily existence. We lived about a half mile apart, and to reach his home meant crossing the practice range or fairways of the Media Heights Golf Club. The private club was always immaculately groomed. That meant summer months could be spent in bare feet as long as you paid attention to the few clover patches on the practice range. That’s where honeybees lurked and would sting your feet if you stepped on them. Summer was full of freedom and reverie, but there were always some dangers for which you had to look out. On rainy days I would grab a set of golf clubs to sneak out onto the course and play golf. Usually I took just the three wood, the seven iron and a putter. With these clubs I could conquer most circumstances. With a couple golf balls in my shorts pockets, I’d tee off behind my neighbor’s house and run from shot to shot. Often I played in bare feet because shoes would get soaked anyway. It did not occur to me to get tired or be scared of getting caught. If a course worker showed up somewhere in a golf cart I’d gather my stuff and hide in one of the sets of pine trees dotting the course. You could always hear the golf carts in the distance so it was impossible to get caught. Like all summer joys, there was always a touch of illicit danger in these rounds of golf. But I treasured them. The streets that formed the subdivision next to the golf course were paved with dark asphalt mixed with tar. These sections would bubble in the summer heat, and it was great fun popping tar bubbles with your finger. There was also Fool’s Gold (Pyrite) stuck in the gravel margins. This we would collect like pirates into cheese boxes made of wood. There was no more satisfying treasure in the world. We’d also play baseball on the far reaches of the golf practice range. Our field was measured and cut into the dirt at the far corner. My brothers and up to 20 other friends would gather for games of “Glo’ball” which was played with a certain style of plastic ball popular on the market at the time. The phosphorescent liquid inside the ball would wear thin soon enough and the balls were between the size of a softball and a hardball. This created a perfect ball for pickup games. You could pitch curves with the ball with minimal effort. And if you tagged it just right with the 29″ bat we used for games (replete with electrical tape and nails in the bat to hold it together) that ball would go on a soaring flight. When not immersed in sports or swimming at the pool, there were always woods to explore. My wonder at birds began at the age of six when my aunt gave me a Peterson’s Field Guide to the Birds. I traced the images of the hawks, and rejoiced at finding species of birds that I’d seen in that book. The Pennsylvania woods was filled with birds; catbird, brown thrasher, towhee, robin, chickadee and many more. These were my companions at times. And when alone I would sometimes strip naked and walk the wooded trails free of clothing. To this day I appreciate that sensation of being naked in the wild. On many vacations as an adult I’d run far from civilization and other people just to spend some time by a lakeshore without inhibitions ruling my mind. There was never any desire to show myself to others. Quite the opposite. These were private communing moments with the feel of nature all around me. In far away northern lakes there was often the chance to skinny dip in cold, clear water. One time while sitting on a sandy bottom of a lake hidden deep in the Wisconsin woods, a bald eagle swooped down to steal a fish from the surface. Another time a mother otter led her four young down to the beach where I was swimming. They spun and rolled in the water and I imitated them on my own. I wanted have fur and buoyancy like them. Because I am an animal too, at heart. All these instincts I credit to those early summers in the Pennsylvania woods. 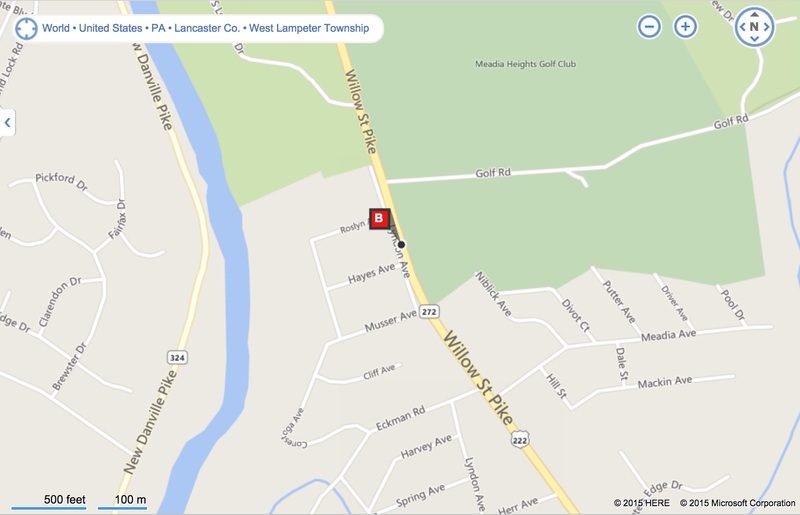 Several muddy rivers passed through our area in Lancaster. These were good for fishing if you did not mind yanking fish out of water that was typically the color of coffee. There were bass also suckers, carp and catfish in both Mill Creek and the Conestoga River. My mother and I often sat for picnics on the edge of one of the dams low in the bottomland of Mill Creek. We’d eat peanut butter and jelly while listening to the even flow of water over the stone dam. Further upstream there was a former flour mill after which the creek was named. It’s ten-foot dam would slow to a trickle over the summer, and my brother and I would hang our lines down to the cool pool below and catch up to fifty sunfish in a day. One of the little streams that fed Mill Creek had salamanders, crayfish and water striders to catch. These were our entertainment between swim sessions. We’d catch them in our Coke cups and let them back go when it was time to swim again. Uphill from the creek we’d run around with our large beach towels after butterflies. We’d pounce on the insects and roll back the towel until we could lift them out of the grass. There were swallowtails both yellow and white, black and spicebush. Fritillaries and cabbage and sulphur butterflies too. Red admirals. Painted ladies. Monarchs and viceroys. We knew how to identify them all. Come evening there were fireflies to catch as well. We admittedly hit them with tennis rackets to see the burst of light it created. Many more we caught in jars and then released. They made the summer nights seem safe and familiar. We’d play games of Capture the Flag in darkness. Hiding behind the bushes as a member of the other team came by made you shiver with anxiety. But if you ever captured the flag, as I did one time with the older kids playing, there were slaps on the back and the knowing glance that said you’d be a big kid some day too. And when night truly fell, my father would switch on the fan in our bedroom and the soft whirr of the blades would lull my brother and I to sleep. We lived well in that Pennsylvania home. No, life was not always perfect and calm. But it was real and fulfilling. That’s all one can ask of one’s summer memories. Want to share a summer story of your own? Write it in the comments below. If we receive enough, we’ll publish a montage. Sorting through Christmas decorations can be a soul-searching enterprise. And that’s good. A few weeks before she passed away from ovarian cancer, my late wife pulled me aside and said, “Chris, I’m sorry about the junk.” She was referring to the many things a couple collects in 27 years of marriage. Over the last year it has been an interesting and sometimes emotionally challenging process to make decisions about what or what not to keep. Some of it was hers, and hers alone. Much of her clothing went to friends and charity. Her jewelry went to friends with the exception of a few meaningful keepsakes saved in her favorite jewelry boxes. Room by room it has been a tour through our lives together. But the Christmas Closet is the biggest challenge of all. Jammed tight with strings of lights and glittering ornaments, thick in boxes and wedged with holiday paper stock and more lights, that closet has been on my mind for nearly two years. This morning seemed like the right time to pull everything out and take stock. I found a few surprises such as a box labeled “Christmas Lights 2015 Good” that would have saved a few dollars on lights for the tree this year. It seems that like most families, Christmas memories are something we treasure but also soon forget. And one must be forgiven for that. The holidays as a whole tend to be much like the Christmas Closet at our house. A jumble of lights and half-wrapped presents and suddenly it’s over. Then we stash it all away for another year. Only when you never attempt to clean out the Christmas Closet it becomes layer upon layer of half-utilized sentiment. And think about it: keeping a year-round closet chock full of Christmas decorations is a bit warped. It’s tough to wrest ourselves free some such sentiment. In July when we’re yanking regular old wrapping paper out of the Christmas Closet to give gifts to our friends or relatives, all that Christmas stuff looks absurd. But once Halloween has turned over the mind turns to winter and Christmas lurks. First the colors brown and orange emerge for Thanksgiving. There’s plenty of that stuff in our Christmas Closet too. It tends to intermingle with the red and green of winter decorations. That’s what makes it so tough at times to decorate. It seems like the entire holiday season extends from October 15 through January 15th. So I’ll be bold. Come out and say it. 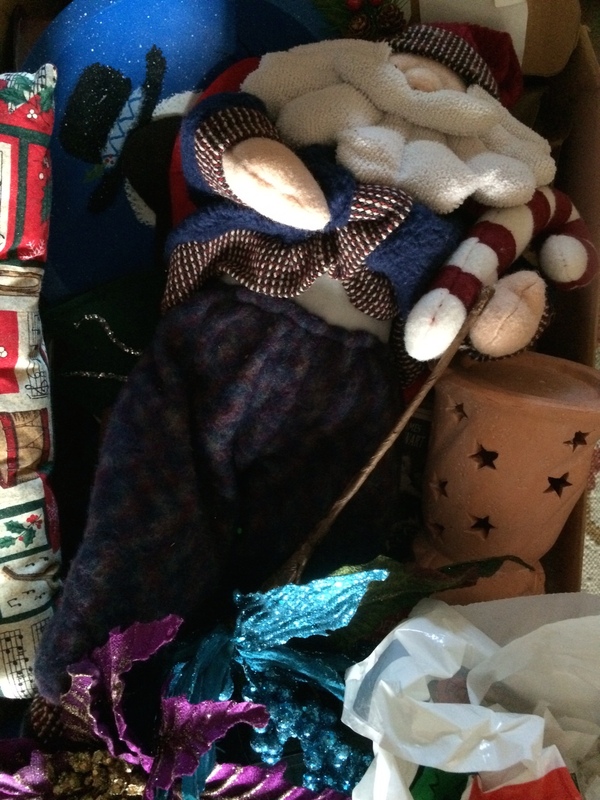 At some point, we have to clean out our Christmas Closets for our own sanity. That means right now there is a living room full of boxes and…and strings of lights, and…and candles and you name it. Some of it has to go. Even my late wife would have to admit that. She’d several times promised to give that closet the once-over. Yet it never happened. There were a couple surprises waiting at the bottom of the storage. 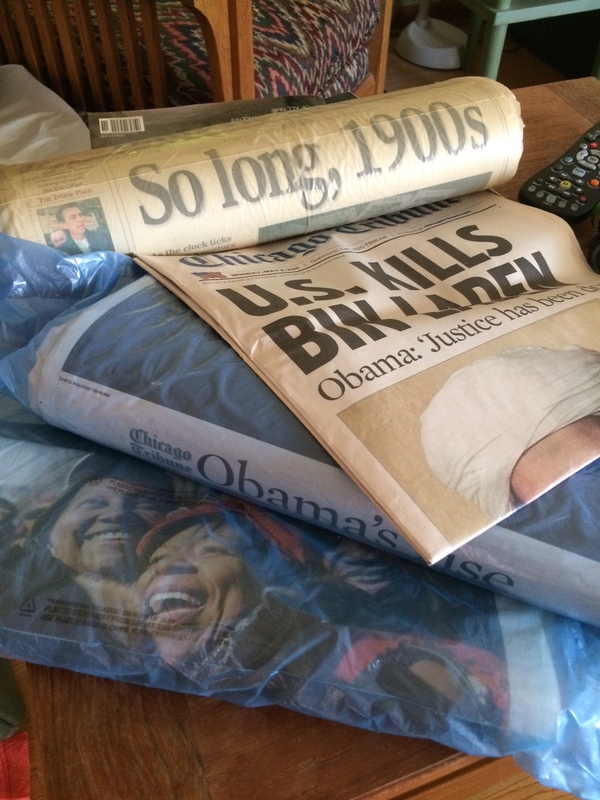 The two newspapers featuring the election of Barack Obama were stashed there, still in the wrappers in which they arrived. She was excited about Barack. She read his books and liked his character. Before she died she wondered aloud why so many people chose to hate the man. “He’s trying to do the right thing,” she said with some irritation at the manner in which political opponents threw up absurd barriers to his policies. Below those newspapers was another announcing the new Millennium as well. That was published before cancer entered our lives. Anyone remember what a big deal Y2K really was? It kind of makes you realize our fears and politics and ideologies really don’t matter that much. What matters is caring about others. And that’s how it goes with things like Christmas Closets. It’s a holiday that rends our souls in so many ways. That is made so clear when watching movies such as “It’s a Wonderful Life.” The stuff that really matters lurks behind all the trappings and the snow and the trauma of family and work challenges. So it helps in some ways to clear out our collective Christmas Closets and take a look at what our lives really mean. The junk we accumulate to celebrate Christmas is not the purpose of the holiday. Otherwise we could walk in that closet in April or July or September and pull out lights to get in the Christmas spirit. The real meaning of Christmas is much, much simpler. It is in knowing our closets well enough to know what’s really in there. That’s the meaning of Christmas. It might help to realize that while you’re putting all that stuff away this year. Christopher Cudworth is the author of The Right Kind of Pride, a book about character, caregiving and community. It is available on Amazon.com.